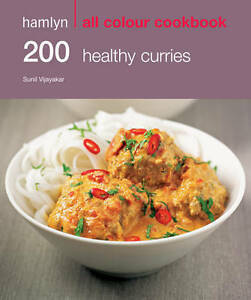 Description An extensive collection of 200 recipes for healthy curries and sides that don't compromise on flavour. Author Biography Sunil Vijayakar was born in Bombay, where, while working as a food stylist for the film industry, he founded a successful catering company. He is now based in London and specializes in preparing food for photography. He has written a number of books including Hamlyn's successful Fresh Indian and contributes to many popular weekly and monthly publications. Books from UK Family run Booksellers. All orders dispatched within 1 working day and delivery is normally 2-3 working days, though please note this is an estimate, not a promise - we are all at the mercy of the Royal Mail! Items ordered on a Friday and over the weekend are dispatched on Monday (unless a bank holiday then a Tuesday), but are prepared over the weekend so cannot be cancelled after midnight on a Saturday. We cannot accept an item is lost in the post until 15 days AFTER the delivery estimate, this allows for all avenues to be explored. We are sorry, if you make an error with your delivery address, this cannot be rectfied after dispatch, we are not reponsible for these errors. It is your responsibility to ensure this is correct within Ebay. You have the right to return your order in it's origional condition for a full refund within 60 days of receipt. Items must be returned in the same type of packaging as received eg a solid board envelope. Please ONLY contact us via ebays messaging system with any enquiries, this is the fastest method for us to link to your order/item to deal with your enquiry. Please do not phone us, use ebay messages instead - one of us suffers from impaired hearing, it is difficult to use the phone! Please note any claims for items not recieved are fully investigated with the royal mail who will aid in prosecution for false claims. Puzzle and colouring books sometimes have minor imperfections, this is the nature of the printing and publication process. Purchasing from us means you agree to all the above. Immediate payment of £3.50 is required.